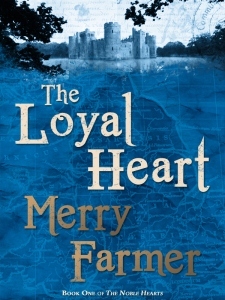 Today’s First Kiss Friday featured guest is Merry Farmer, author of medieval romance The Loyal Heart. Welcome Merry! And I’d also like to wish Merry a very happy birthday! Today is her birthday. 🙂 Here’s the first kiss between Aubrey and Crispin. “You’re awfully quiet,” she broke the silence when they were in the stairwell. He cleared his throat in vain. “I have nothing to say.” It was true. He didn’t want to say anything. They continued up the stairs and along the hallway in silence. When they reached her room Aubrey entered and started to shut the door behind her. He stopped it from closing and stepped inside. “I thought you didn’t have anything to say.” One eyebrow quirked up over flashing eyes. She stood firm but didn’t order him out. He searched her eyes for panic, fear, rejection. He found steel. “Buxton has given his consent.” She repeated his statement with a flat stare, crossing her arms. “Buxton.” She blew out a breath and shook her head. The question withered the coil of heat in his gut. “He gave me land and a position of power and respect.” He couldn’t meet her eyes as he gave his worn excuse. Yes. He did. The truth twisted his stomach. His mouth crashed over hers before she could finish. He pulled her against him, one arm tight around her waist while the other cradled the back of her head. Her body was rigid in his arms as he tasted her, curled his fingers in her hair. She shuddered and her fingers dug into his biceps as he softened his kiss, teasing his tongue across hers, nipping at her lips. The hand on her waist caressed lower, splaying on the contour of her bottom, between her legs, pressing her hips up against his. He tipped her chin up and lowered his hungry mouth to her neck, licking her fiery pulse. Her nails burrowed harder and the groan from deep in her throat snapped him to his senses. Gasping Crispin stepped back, pressing his wrist to his mouth and whipping away from her. “I’m sorry,” he panted, “That was inappropriate.” His voice was gruff with shame as he tore past her. “Crispin-” She called his name as he fled into the hall, slamming the door behind him. 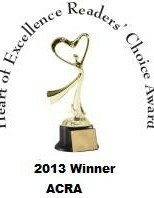 Thanks for being my featured author for First Kiss Friday. Shhh. Don’t tell. My birthday is Wednesday! 🙂 Hope you had a great day!